MILAN, Italy (Bloomberg) -- Fiat S.p.A. chief executive Sergio Marchionne confirmed the Italian carmaker's pledge to spend 20 billion euros ($27 billion) revamping its domestic plants after meeting with Prime Minister Silvio Berlusconi. “Fiat is a multinational which is expanding internationally, but will keep an Italian heart,” Industry Minister Paolo Romani said on Saturday after discussing the investment plan with Marchionne and Fiat Chairman John Elkann. Romani attended the meeting with Berlusconi and other members of the government. “It's evident that the positive evolution of Fiat's plan for Italy will condition the decision on” the location of its headquarters, Turin Mayor Sergio Chiamparino said after attending the meeting. 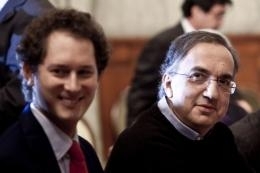 “Marchionne and Chairman John Elkann confirmed Fiat's and Fiat Industrial S.p.A.'s intention to invest 20 billion euros in Italy,” the prime minister's office said in a statement today.